My son got interested in a loudness circuit again, and we tried coming up with one that that would take few components. We decided on having a 3-stage system: a preamp to get voltage up, a peak (or trough) detector with low-pass filter to extract the envelope, and a log amplifier to convert to a dB scale. We were planning to use a Schottky diode, rather than a precision rectifier for the peak detector. Block diagram for loudness sensor using peak detector. The gain of the first stage was set by looking at the sensitivity of the SPU0410HR5H‐PB silicon microphone and the maximum loudness that the system should be able to record. The mic has -42±3dB sensitivity referenced to 1V/Pa. That means it has 7.94mV/Pa. The loudest sound for the mic should be the sound level at a rock concert, approximately 120dB referenced to 20µPa—that is 20Pa. So the microphone should have an AC output of about 160mV. Because he is planning to work with a 3.3V power supply, a gain of 10 should just keep the signal within the rails. Here is the loudness circuit, before the component values have been determined. To get a gain of 10 (actually –10), we need R2=10*R1. The R1 C1 time constant determines the cutoff for the high-pass DC-blocking filter. A reasonable cutoff frequency is 10–20Hz, giving an RC time constant of 8–16msec. Picking a cheap value for C1 (0.1µF), gives us R1≈100kΩ and R2≈1MΩ. The peak finder is just a Schottky diode charging C2 through R3, with R4 slowly discharging it. Because the signal does not spend a long time at the peak, we want R3≪R4, so that we can catch the peaks. We also want a moderately rapid attack (to catch percussive sounds quickly) and a fairly slow decay, so that low-pitched sounds do not appear as fluctuating loudness. We also want R4 to be sized so that the log amplifier has a good dynamic range. We probably want to keep the currents through Q1 to between 0.2µA and 2mA, which suggests R4≈1kΩ, and R3≈47Ω. To make the R4*C2 time constant around 0.1 sec, C2 would have to be 100µF, which costs about 50¢, so it may be cheaper to put in another op amp to separate the peak detector from the log amplifier, using a smaller C and larger R for the peak detector, followed by an op amp, then the low resistance for the log amplifier. Modified loudness circuit with unity-gain buffer to separate peak detector from log amplifier. Now we can make C2 be a reasonable size (say 0.1µF) and scale R3 and R4 to match (say 100kΩ for R4, to get a discharge time constant 0f 10msec, and 1kΩ for R3, to get a charge time constant of 100µsec). This also limits the current drawn from U1 to 1.65mA (well less than the 15mA short-circuit current). R5 can now be made fairly small (say 470Ω) to give us a large dynamic range on the amplifier. If Q1 is an NPN transistor with characteristics like the S9013 transistor that I tested when I was playing with log amplifiers, then the output should range from Vref-0.65v up to almost Vref, which at 3mV/dB gives a range of over 200dB (which we certainly won’t get—the log amp may be good to 80 or 90dB. If the ADC has 10-bit resolution on a full-scale range of Vref, then the steps are about 0.55dB (a 12-bit ADC would have steps of about 0.14dB). Along the way, I realized that I had never plotted a voltage-versus-current curve for the Schottky diodes, to confirm the theoretical formula , where IS is the saturation current of the diode. I did those measurements this morning, using a 1N5817 Schottky diode, a series resistor, a series potentiometer, and an Arduino (Leonardo) board. I measured the voltage across the resistor (to get current) and across the diode. When my son gets the Data Logger working with the KL25Z boards, I’ll probably want to redo these measurements with higher precision. Note that both VT and IS depend on temperature, and I did not measure the temperature (probably around 18ºC). IS normally doubles for every 10ºC temperature rise, so any measuring device relying on these characteristics would need to have temperature compensation or calibration to correct for temperature. 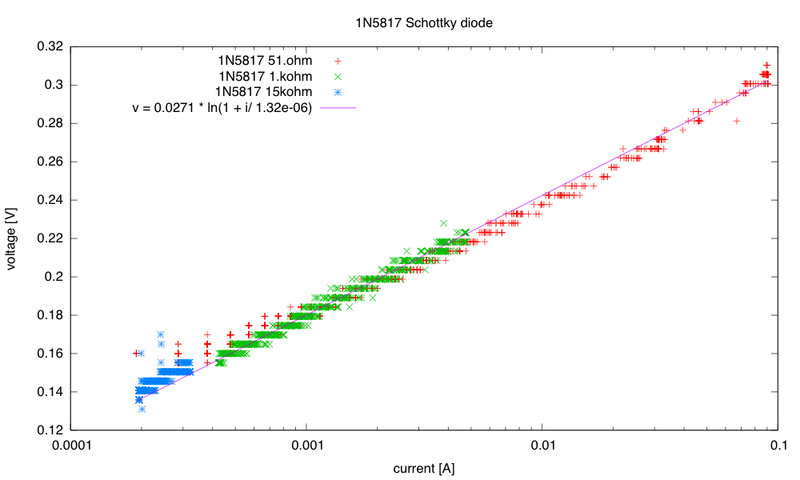 In any event the IS values for the Schottky diodes are much larger than for the base-emitter junctions, so voltage drop across the diode is much smaller for a given current—which is why we use Schottky diodes!